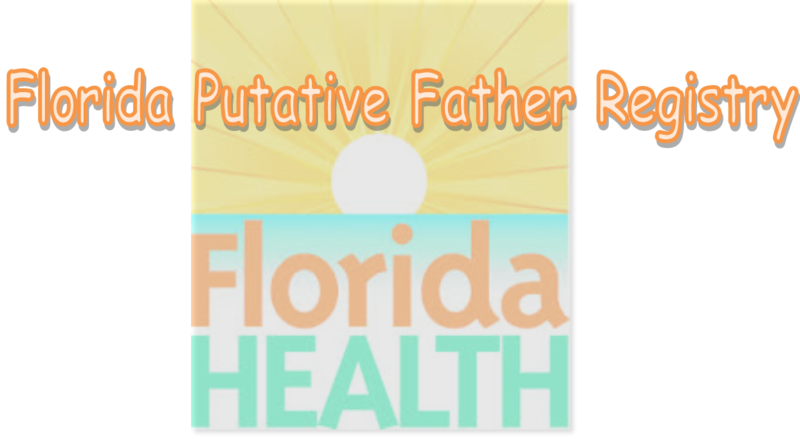 What Is the Florida Putative Father Registry? During the Adoption Reform Act of 2003, the State of Florida instituted the Putative Father Registry, which is established within the Florida Department of Health. In general terms, a putative father is defined as a man, whose relationship to a child has not been legally established but who claims that he is the birth (biological) father of a child born to a woman that he was not married to at the time of the child’s birth. The rights, if any, of a putative father are determined by state law and can vary from state to state in adoption cases. What Is the Purpose Florida Putative Father Registry? The purpose of this Registry is to allow any man that alleges to be an unmarried biological father of a child, to preserve his right to receive notice of any adoption proceeding involving his child and provide him the right to consent (or object) to the adoption. Do I need to search the Florida Putative Father Registry for my Florida Step Parent or Relative adoption case? Yes. In the State of Florida, a certificate of search of the Florida Putative Father Registry is required to be able to finalize an adoption. This includes stepparent adoptions as well as grandparent and relative adoptions. There is no specific provision in Florida law that requires such a search in adoptions of adults, as the consent of a birth (or biological) parent is not required. Who can request a search of the Florida Putative Father Registry? The registry may also be searched by Court Order. It is not uncommon for a family to file a Motion to Search the Putative Father Registry when consent of the biological mother cannot be obtained. These restrictions vary from state to state, and a person with a pending adoption case in the Florida courts may not be permitted by law to search the registry in another state. Does every state have a Putative Father Registry? No. There are a number of states that do not have a Putative Father Registry, and those are: Alaska, California, Colorado, Connecticut, District of Colombia, Hawaii, Idaho, Kansas, Kentucky, Maine, Maryland, Massachusetts, Michigan, Mississippi, Nevada, New Jersey, North Carolina, North Dakota, Oregon, Pennsylvania, Rhode Island, South Carolina, South Dakota, Vermont, Washington, West Virginia, and Wisconsin. It is important to have the most accurate information regarding this issue for a number of reasons. For pro se (unrepresented) litigants contemplating a Florida relative or stepparent adoption, it is important to be armed with this information so that you do not spend your valuable time trying to get a court order to conduct a search of the registry. If you are the biological mother in a step-parent adoption, or if you are a relative adopting a child where the biological mother is cooperative and is signing consents for adoption, then you can have her sign the DH 1963 application for the search of the Registry. The DH 1963 is an important Florida relative adoption and stepparent adoption form. Some deputy clerks of court in Florida aren’t even aware that a biological mother has the authority to search the Registry without a court order. It is also important to know that sometimes the Court, in error, may want you to conduct a search of the Putative Father Registry in another state. First, Florida adoption laws do not require a search of the Putative Father Registry in another state to finalize your adoption; Second, the other state may not have a Registry; and Third: there are usually restrictions in other states as to who can request a search of the Registry due to confidentiality or jurisdictional concerns. What do I do if the Court asks me to search an out-of-state Putative Father Registry? Although this should not happen, it sometimes does. If the “other state” does not have a Putative Father Registry, then the solution is easy and you can notify of the Court of that fact. Under any other circumstances, you may want to point out that Florida Statutes Chapter 63 does not have a provision which requires a party to an adoption in the State of Florida to conduct a putative father registry search in any other state other than Florida. Does it cost money to search the Florida Putative Father Registry? Yes. An expedited search costs $19 and is payable by check or money order to the Florida Department of Health. Will Florida Family Adoptions help me with obtaining the Florida Putative Father Registry (PFR) search certificate(s)? Yes, processing the PFR application and obtaining your certificate(s) for your file is part of the service that we provide. Our goal is to file your Florida relative adoption or stepparent adoption paperwork as a complete package with the Court, and the Putative Father Registry search certificate is an important part of the process. How can I learn more about filing a relative adoption or a stepparent adoption in Florida without a lawyer? Florida Family Adoptions is the only document preparation company in Florida that is a member of the Florida Adoption Council and specializes in pro se adoption nonlawer document preparation assistance. Simply give us a call, or complete the contact form below and we will be in touch soon.